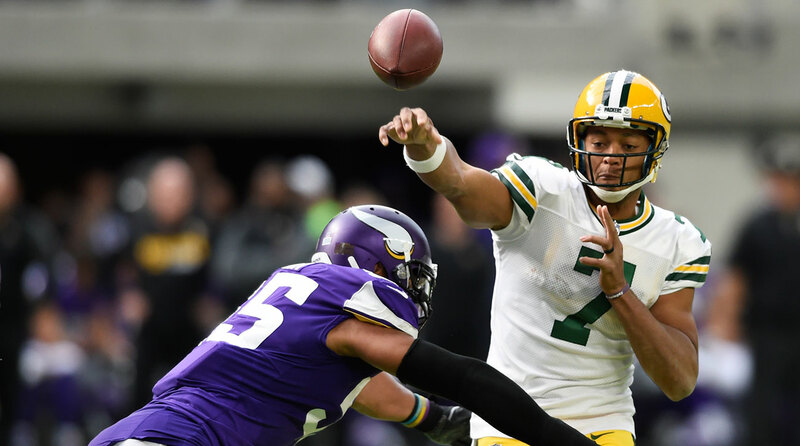 Former UCLA linebacker Anthony Barr cleared the way for Hundley as the current Viking laid the hit that knocked Rodgers out of the game. Rodgers rolled out of the pocket and threw a pass to tight end Martellus Bennett, who dropped the ball. Barr drew some scrutiny for the play, with Packers head coach Mike McCarthy telling reporters he thought it was “an illegal act” for Barr to “pin (Rodgers) to the ground like that” after following through on the tackle. For his part, Vikings head coach Mike Zimmer didn’t think it was a dirty play. SB Nation writes that Kenny Clark was a “monster again on Sunday” for the Packers, tallying six tackles, a tackle for loss and a forced fumble. This entry was posted in Football and tagged Brett Hundley, Cassius Marsh, Jayon Brown, Kenny Clark, NFL by Thuc Nhi Nguyen. Bookmark the permalink. You guys, we’re missing the best part. It was Barr the QB Killa adding another pelt to his wall. Somewhere Fatt Barkley shivered.